This week’s artist became a star by really being in the right place at the right time. Her parents both worked for a record company and when their daughter joined them one day she went to the bathroom and began singing where she was overheard by a producer who told her she was going to be a star. It’s a fairytale story, but a true one. Evelyn King came from a family who were in the music/entertainment business, her uncle was an actor who had appeared in the first Broadway revival of Porgy and Bess and then went on to work with Lena Horne, her mother was a manager for a soul act called Quality Red and her father was a resident backing singer at The Apollo Theater in Harlem, New York, so it’s not too much of a surprise that Evelyn was going to follow suit. Evelyn was born in the Bronx in July 1960 but the family moved and she was raised in Philadelphia. Her parents both worked at Philadelphia International records and when Evelyn was old enough she got a job at the label as a cleaner. It was when an in-house producer, Theodore T. Life, a former member of the band Instant Funk, heard this voice coming from the ladies room that he discovered someone special. “I was cleaning the bathroom and singing Sam Cooke’s song A Change Is Gonna Come and this producer said he loved my voice and was gonna make me a star”, recalled King. The version that appears on Smooth Talk is quite different from the single that made the chart. It was only when two New York club DJs, Al Garrison and David Todd, gave the song a re-mix, beefed up the beat and extended it to a 12″ single version running to just over six and a half minutes that it gained airplay and became a hit single. In America it reached the top 10 on the singles chart, the dance chart and the R&B chart as well as peaking number seven in Belgium. In the UK, despite heavy club play – and I was one of them – it only just scraped into the UK singles chart at number 39 but spent an incredible 23 weeks on the chart. The nearest anyone has come to that was in 2016 when Joel Adams’ hit Please Don’t Go spent 20 weeks on the chart but climbed no higher than number 50. Can you hum it?! She later signed to RCA and released several songs including I’m in Love which was the first to crack the UK top 30 but her biggest hit came the following year when club favourite Love Come Down reached number seven. By now she was no longer credited with ‘Champagne’, why? 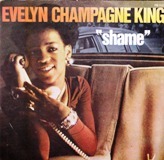 “As far as I’m concerned I’ve always been Evelyn ‘Champagne’ King, it’s never been taken out…not by me anyway. I think the record company dropped it just to see what happened but I told them that nobody would know Evelyn King, but that’s what happened. She continued to release albums, Face to Face (1983), So Romantic (1984), A Long Time Coming (A Change Is Gonna Come) (1985), Flirt (1988), The Girl Next Door (1989) and I’ll Keep a Light On (1995) and took a break when she married music director Freddie Fox. In 2002, Shame was featured in the 2002 video game Grand Theft Auto: Vice City and two years later became one of the first records to be inducted into the Dance Music Hall of Fame. She made a comeback in 2008 with the album Open Book and its lead track, The Dance, went to number 12 on the US dance chart. Her final album to date was 2011’s Outside the Skyline of which the single Everybody, a duet with Miguel Migs was released.